Welcome to my little corner of the internet! My name is Kayla Bryant, and I am a third grade teacher in Napa, California. I have been teaching for 5 years, and my favorite thing about teaching is helping my students meet their goals- academic, behavioral, or otherwise. Because of this, I have spent the last 3 years implementing goal setting strategies with my students. By setting goals in the classroom, I hope to instill in my students the lifelong skills of responsibility, and ownership of their learning and actions. I want my students to know and feel that they are in control of the learning they do, the things they accomplish, the way they behave, and their future. I want to teach students how to meet their goals, so that they can feel proud of their work and we can celebrate their learning together. This year and throughout the program, I have been on a journey to try to simplify the goal setting process with my students, and to make it more engaging. One way I have been able to do this is with the inclusion of tech tools in the classroom. 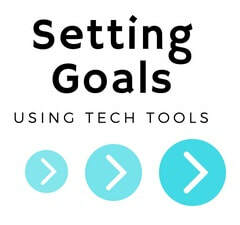 I hope that this website contains all of the tools and resources you need to implement goal setting strategies in your own classroom, however if you'd like to read more about my journey throughout my master's program with Touro, please check out my blog at kbryanttuc.weebly.com. I believe that all students are capable of learning at high levels. Every student is different and deserves to be met where they are and taught at their own individual level. Supporting students in meeting their goals brings me the most joy as a teacher. Seeing students become engaged in the learning process and become lifelong learners is my ultimate goal for every child who enters my classroom. I believe that learning should be fun, interactive and customized. My journey through the Innovative Learning program with Touro University has been transforming. Before the opportunity presented itself with Napa Learns, I had never seriously considered obtaining my master’s degree. I didn’t think I needed or wanted it, but here I am having completed my courses and feeling eternally grateful for all of the knowledge that has made me a better teacher this year, and a mindset which will be with me for the rest of my career. Developing an understanding of TPACK through this program has helped me to implement new technology tools into my classroom. This enhanced my student’s goal setting experiences and my ability to conduct meaningful research surrounding it. Using technology in the classroom in conjunction with pedagogy and content is the only way to use technology effectively in the classroom. Without pedagogy and content, technology has little to no purpose in the classroom. When the three are used in conjunction with each other, teachers can create lasting learning and inspire students to be their best. Overall, what I’m hoping to share with the world of education after completing this program, is that innovating involves taking risks. We have to try out lots of new things, and keep only what works for our particular students with our content and curriculum. This means each year, innovating in the classroom may look different, not to say that we throw out what is tried and true, but to say that we can always find a way to make our teaching better- more interesting, more current, and more applicable. In 2018 elementary school students are expected to work on and complete multiple online learning programs, engage in rigorous learning activities while behaving in class and at school, participate in extracurricular activities, and read nightly at home. These students, ranging from ages 4-12, tend to struggle to stay on track with what their learning goals and objectives are without the constant help of a parent or teacher. These students are learning in 21st century classrooms and they are getting ready to be lifelong earners. They need tools to help them stay organized and on top of their own learning. Students need to be able to keep track of their own data, test scores, reading points, program progress, behavior goals and progress.These challenges provide an opportunity for some exciting tools our students can use to keep themselves on track with their learning. These tools require students to be responsible for their own learning, creating a culture of student agency in the classroom. In my 1st-3rd grade classrooms over the past 3 years, I have implemented goal setting strategies with my students. With my first and second graders I had been doing a lot of the goal setting work myself, printing out student’s scores, writing down where they should be, helping them establish goals, meeting with them individually or in small groups, and instructing the students on what to write on their papers, then checking in at the end of the time frame to do the whole process of pulling data and evaluating whether students met their goal and then meeting with them individually again. This process was great in the sense that students were getting a lot of feedback on where they were in the learning process, and thinking about what they could do to help themselves meet their goals. Students were becoming aware of what their goals were and how they could meet them, and were being held accountable for whether or not these goals were met. Please feel free to contact me with any questions or comments, I'd love to hear from you!